Now isn’t the Internet a terrific thing? You can stay at home comfortably (actually in your castle), place an ad and in no time you gather a bunch of young and very talented musicians and a new band is born. This is not exactly what happened with Stream Of Passion, since Arjen Anthony Lucassen had worked previously with Marcela Bovio (singer of the Mexican band Elfonia) on the The Human Equation album (she played the Wife on it) and this band and its music was created around Miss Bovio's excellent vocal skills. Aside from her, the band consists of Alejandro Millan on keyboards/piano (also Elfonia), Lori Linstruth on lead guitars, Johan van Stratum – bass and Davy Mickers on drums. (So, after the concept albums and rock operas of the Ayreon phenomenon, the more straightforward metallic sound of Star One and the strange & beautiful ambient feel of Ambeon, I was really curious to see what kind of sound AA Lucassen has produced for his new baby. Tell you the truth I have been a die-hard fan of Lucassen ever since The Final Experiment was issued and I had great expectations for this album. After the first spin I was completely baffled by it, with feelings bordering on disappointment and awe. It was everything and nothing I expected. Most of all, the album has an incredible and powerful atmosphere, haunting and eerie in the first half, melodic and warm on the second. Progressive, atmospheric, metallic, psychedelic elements blend to create a challenging sound that will need the listener’s undivided attention and focus just to be able to reach through the multiple layers of the music and reach the heart of the music. Marcela Bovio is definitely the pivotal element in the band, her talent allowing her to sound serene and angelic on one track or strangely unearthly on other. Not singing in an operatic way, she manages to convey all types of feelings and emotions through her beautifully crafted voice. As I said before, the album seems to me evenly divided in two parts, with the opening part more atmospheric and experimental. The opening track, Spellbound is a dark mood song with a psychedelic drum beat with vocals lines in the vein of Anneke van Giersbergen (The Gathering) and a fine mix of piano and strings with a wailing violin in the background. 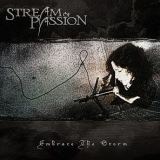 Passion is a balanced tune with clear solo vocal lines and full forced progressive metal rhythm. The excellent groovy Deceiver has a very catchy chorus and crystalline keys alternating with violin leads. Excellent guitar solo on top of the chorus puts the spotlight on Lori Linstruth. I’ll Keep On Dreaming starts slow with serene vocals and nice flowing guitar leads an excellent ambient flavor. Haunted is a piece that reminds me of Kari Rueslatten’s way of singing (The 3rd And The Mortal), with a strange feel, eerie piano leads and staccato drumming. Excellent high notes by Marcela Bovio riding the heavy crunchy guitars. The dreamy Wherever You Are is built on a power guitar lead with background keyboards and quiet silky vocals inserted supported by piano hooks, developing into a power tune with full forced instrumental finish. Entering the second half of the album we find the terrific anthem Open Your Eyes an addictive piece with Marcela Bovio at the top of her game, starting with quiet emotional lines backed by a beautiful sounding cello, with nice crescendo over piano and smooth drumming exploding into one of the most uplifting, emotional and gifted guitar solos supported by a powerful but oh so quiet rhythm section. The perfect mix of steel and silk with Bovio’s style resembling a nightingale’s heavenly song in the middle of the quiet night. The title song Embrace The Storm would be the star of any Ayreon album, especially on Into The Electric Castle or The Universal Migrator, with Arjen’s trademark of incredible catchy guitar rhythm so beautifully crafted into the complexity of the song. Rich sound and superb flow with quiet verses carries the song into the balladesque soft Breathing Again which has a superb violin courtesy of the same Marcela Bovio with symphonic background and open emotional vocals. Sharon den Adel spirit comes to mind while listening to the display of passion. Out In The Real World is a fast paced, keyboard driven, progressive Ayreon-type song, with angelic vocals, complex arrangements, superbly carved guitar solos alternating with unplugged guitar/piano parts. Nostalgia is a Mexican duet between Marcela (here singing in Spanish) and Alejandro Millan’s piano, a quiet and full of heart performance from both of them, with wonderful chemistry between them. The closer Calliopeia is again a mix between the moody atmosphere, dreamy vocals and the ayreonautic guitar parts with a groovy feel. This is not an easy album. It takes time to sink in and each time you listen to it, you discover a new meaning or a different approach from each song. Some of you will hate it; others will rate it as the Album Of The Year. What nobody will do, is ignore it. It definitely needs the listener’s undivided attention and open mindedness. I’m not trying to say that it’s an eclectic piece of music that it’s meant just for le connoisseurs; just open your heart and your mind and let the music take you on its wings. The flight will be a wonder.